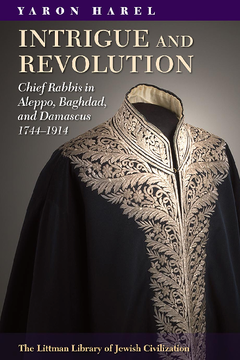 This is a book of unexpected drama: all eleven chief rabbis appointed in this period of unprecedented change in the Jewish communities of the Fertile Crescent became the subject of controversy and were subsequently dismissed. This took place against a background of events rarely discussed in the context of Jewish society: crime, hooliganism, slander, power struggles, sexual promiscuity, and even assaults and assassination attempts on rabbis. Using a wide range of testimonies gleaned from Ottoman Jewish, Arabic, and European sources, Yaron Harel paints a colourful picture of these upheavals set firmly in the social and political context of the time and far removed from the commonly accepted image of Jewish communities in the Ottoman empire. Jews were also affected by modernization and political conflict in the wider society of the time, and these too gave rise to power struggles. The chief rabbis were at the forefront of these confrontations, especially those that resulted from the new inclination towards Western culture. Most of them recognized that the challenges of modernization had to be met, although in a way that did not endanger religious principles. Their openness to change stemmed from a concern for the future of the communities for which they were responsible, but they were often vociferously opposed by those who were free from such responsibility. The communal politics that ensued were sometimes heated to the point of violence. In the latter years of the empire, many Jews came to support the Young Turks, with their promise of liberty and equality for all. The atmosphere of the time was such that rabbis had to develop political awareness and engage in Ottoman politics. This was another source of tension within the community since the new regime punished anyone suspected of opposition severely. This lively and fascinating study based on little-known sources offers a lens through which to view the Jewish society of the Ottoman empire at a time when all the traditional norms were being challenged. Yaron Harel is Professor of Jewish History at Bar-Ilan University. His contribution to the field of oriental Jewish history, especially in Syria, been recognized in a series of awards, including the Aminoah Prize (2000), the Ben-Zvi Prize for Research in Oriental Jewry (2004), and the Zalman Shazar Prize for Research in Jewish History (2009), He is also the author of The Books of Aleppo: The Rabbinic Literature of the Scholars of Aleppo (1997) and of the volume Syria (2009) in the series Jewish Communities in the East in the Nineteenth and Twentieth Centuries, and co-editor, with Yom Tov Assis and Miriam Frenkel, of Aleppo Studies - The Jews of Aleppo: Their History and Culture, Volume 1 (2009).